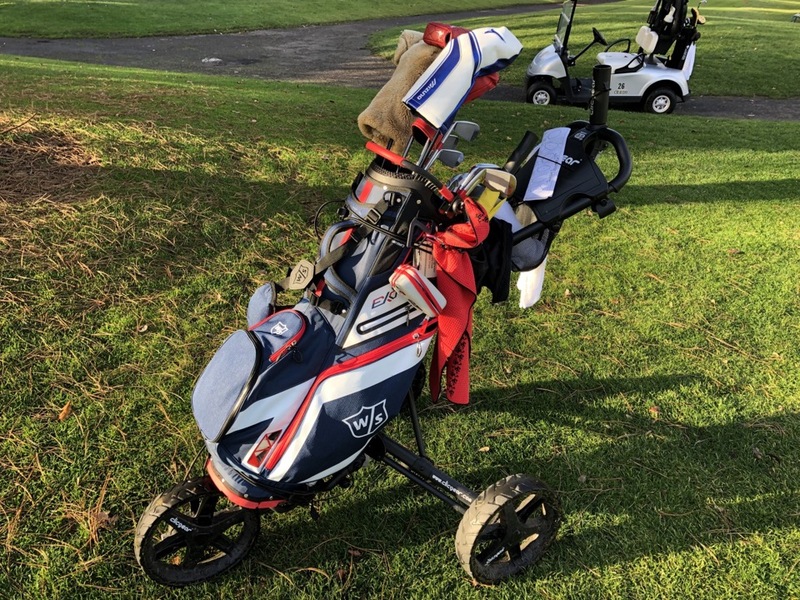 Wilson’s new eXo carry bag is a lightweight carry bag loaded with multiple pockets and extra features to help you enjoy your round while carrying your clubs. 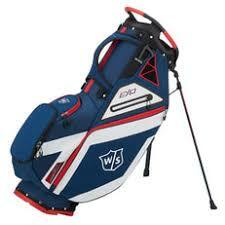 If you are a serious golfer it is likely that you are also a discerning golf bag person. The golf bag is analogous to the toolbox for the golfer. A toolbox is extremely important to a tradesman. There are keys you look for in purchasing the toolbox, like weight, colors, organization, number of pockets, overall functionality, and durability. Many tradesmen I know have decals for showing off school colors or places where they have worked. They become personal and unique to the person using them. With golf bags, the parameters important for a toolbox are also important for golf bags. This becomes doubly important if you carry your bag, put it on a push cart, or load it onto a golf cart for your regular round of golf. If for example you are a regular carrier of your golf bag then weight, pockets, and the stand are likely of key importance for you. 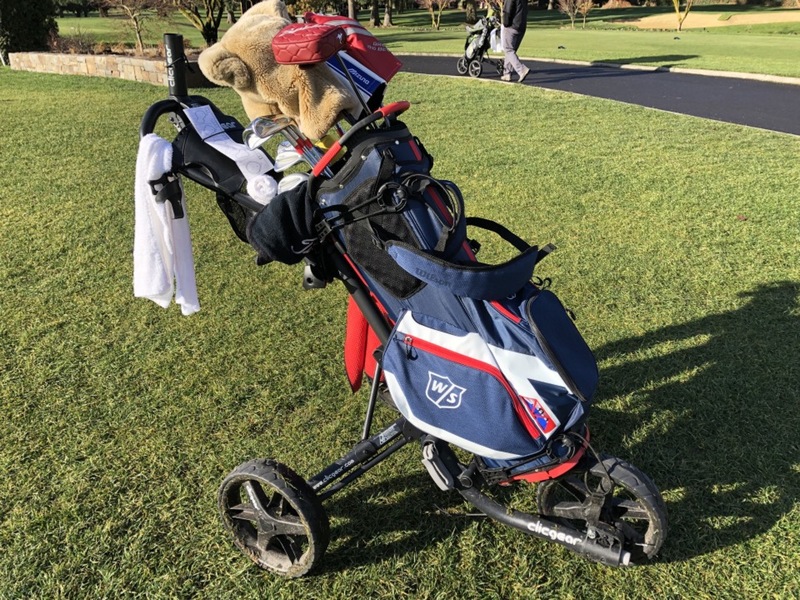 I was given a Wilson Staff eXo carry bag for review and I used it for about a month before writing this review. 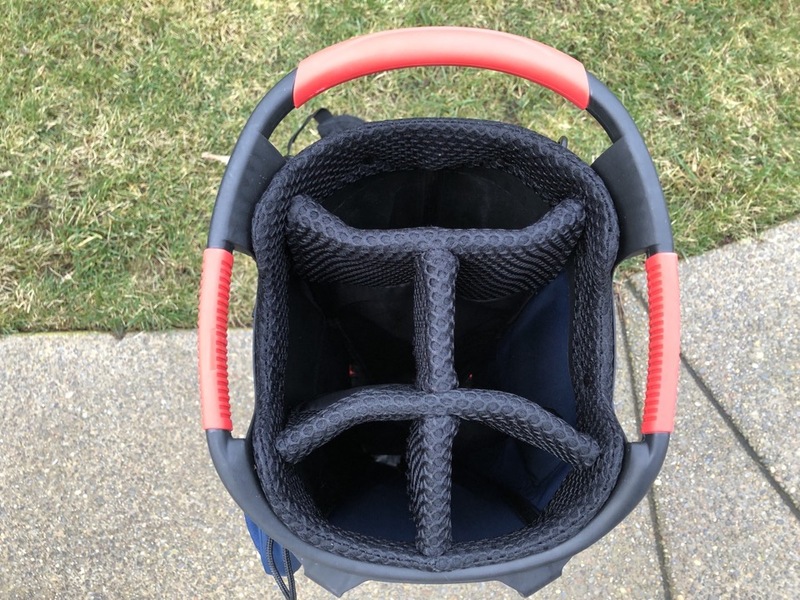 Because I am a serious golfer I took this review of a golf bag very seriously. I carried for a few rounds and had it in my regular configuration which is on a push cart. Without further ado, here is my thoughts. As I mentioned with a toolbox, the personal characteristics of a golf bag are very important. Color choices are key. Some golfers will use their bag to stand out, and some want their golf bag to be like their luggage and fit in with the other thousands of black bags at the shop. 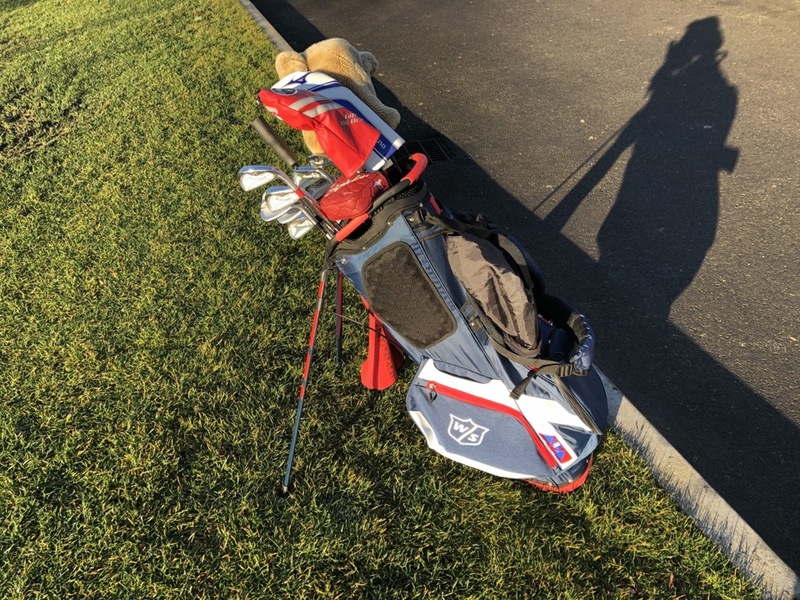 I think the Wilson eXo golf bag does a nice job of threading the needle between the conservative choices that golfers usually go for and adding some color to stand out a bit. The main part of the bag is done in a sharp navy blue. We can call that the base color of the bag. The next primary color is red, and it is a red I would put in a similar camp to the red in the American flag. Bright but because it is the secondary color not overwhelmingly so. The last color choice is white. The white is mostly chosen to allow the logo to stand out in many of the pocket locations. For example in the large pocket opposite where it would sit on our back there is a large white section where the Wilson logo can be found. 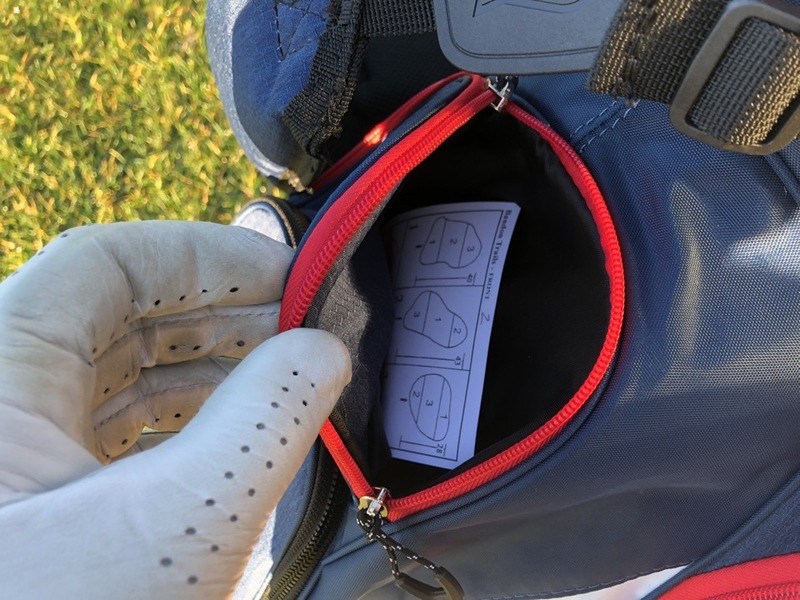 There is also some black that is found on the bag, but it is mostly used in areas where padding is added, for example on the top opening of the bag where the clubs go in, the underside of the straps for carrying the bag and also where your back rests when carrying. It seems like this is likely a sourcing issue, where they likely have different color bags but the black material goes onto all the different color bags. I have always held the position that black and navy blue are not great for matching. In my opinion, the black is a bit of a miss. The material for the bag is the high performing acrylic chosen for its durability and lightweight. In the golf bag game ounces matter, therefore each material choice is critical. The acrylic material is fairly common amongst most manufacturers with the exception of PING. 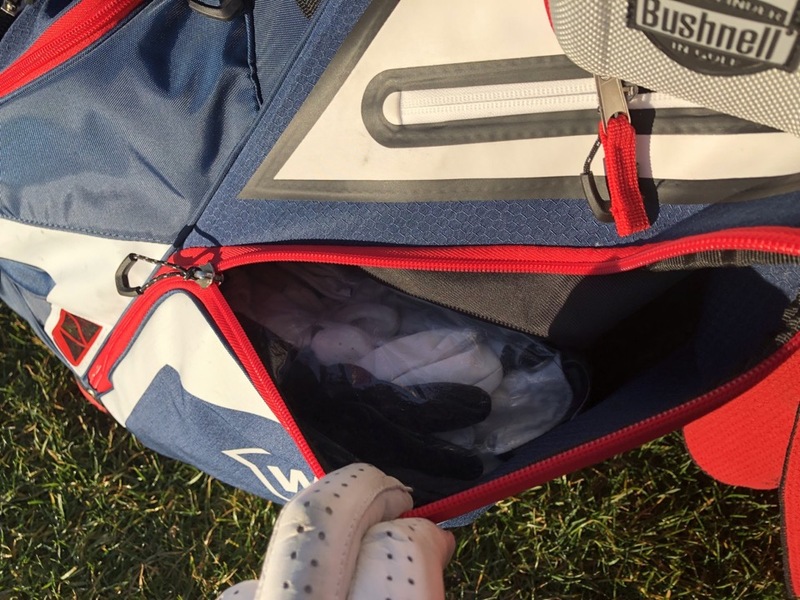 I have numerous other bags from Nike, TaylorMade and others with the same acrylic type of material chosen for its durability and weight characteristics. When I was thinking about how to do the evaluation of the bag, my thoughts often centered around how useful the bag was. That is why I am referring to this section as usability. To start this part of the review we should start at the top. The key function of the golf bag is to hold the clubs, but to leave it at the ignores how useful the bag is. More importantly than does it hold them, is are the easy to find? The simply answer is yes, I found finding clubs in my Wilson eXo carry bag quite easy to accomplish. The reason for this was because the opening for the clubs was both clean and seemed large. I believe this was accomplished by the wide handles that were added to the bag. The handles appear to be a new addition to golf bags which I am a big fan of. In the case of the eXo carry bag there were three. One on each side and one on the top. These handles make it easy to grab the bag to pick it up to carry, put onto the cart, or move somewhere easier. Three handles might be a bit over the top but better to err on the side of too many than not enough. These handles were a sturdy plastic then covered with rubber to make them easy to grip. The other smart thing that was done with them was to make them wider than the opening of the top of the bag. This made them easy to grab onto and also gave the top of the bag a wider feel than if they were flush with the opening. If you are someone who carries their bag then you are definitely going to be interested in the stand itself. In my youth stands where not very reliable. Often you’d need to use your foot to help the legs reach their potential resting position. This could be a real point of frustration. The eXo carry bag has definitely spent some engineering cycles on how to make a very solid stand. For starters the stand is made very sturdy. The legs are about an inch wide and about a half an inch thick. They have a large rubber stopper at the bottom which means they are comfortable on grass and also on concrete, something not all stands do well with. The mechanism for putting out the stand could at time be finicky but once you get the hang of getting it set up, it was easy to do reliably. The other part of the bag that makes the stand work well is the forty-five-degree angle built into the bottom to help the bag sit more flat. The stand and bottom of the bag is without question the best feature this bag has. The advertising for the bag goes into great detail about the pockets. I will say as someone who walks for ninety plus percent of their rounds pockets are critical. In my mind there are three keys to golf pocketing. The first is it easy to get new golf balls. This is key because after you get your first one out if you need to go in there again it is most likely because you hit it into the water or out of bounds and now need to quickly get another one. I would put the eXo carry bag on par with other bags for this pocketing. I like to put balls in the pocket where your left hand rests when carrying the bag and balls fit well there as they do in most golf bags. The second key pocket is around where to put my sweater and jacket once it gets warm enough. Golfers mostly utilize layering and so a place to put your sweater or jacket is key. Unfortunately the eXo carry bag does not excel here. I was able to put my sweater into the bag but the big pocket is not very big. I feel the designers could have done a much better job giving me more space for sweaters. In many cases I found I had to put my sweater into the extremely large pocket on the top of the bag. This was serviceable but I often put sunscreen, used balls, and tees in the pocket which made getting my sweater in there a challenge. The last key pocket is for the item I used most in my round, the rangefinder. The rangefinder is my fifteenth club. The eXo carry bag has a pocket right above and integrated into the pocket that sits next to your left hand when you are carrying the bag. This is the number one design feature in my mind for this bag. I could easily get my hands on the rangefinder slipping it in and out easily without fear of leaving it behind somewhere. This is an enormous bonus if you are a person who carries their bag and utilizes a rangefinder. I haven’t seen a pocket designed so well for a rangefinder like this. 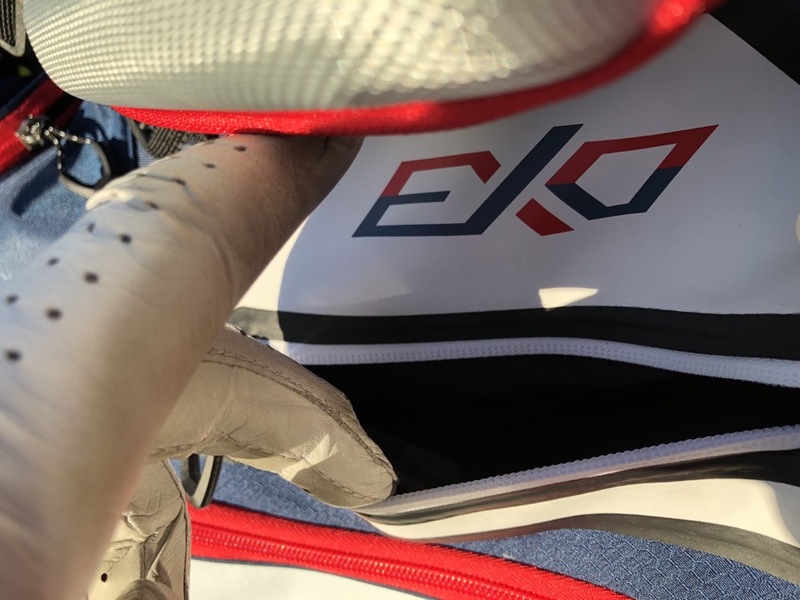 The eXo stand bag has other pockets that are well designed as well. The ball pocket, or the one at the bottom top side of the bag is frankly huge. On top of that pocket is where I like to put tees and ball makers, this was a standard pocket and served its purpose well. Could stuff many things in there. It also has a valuables pocket integrated into the big main pocket which is waterproof and very easy to zip and unzip. If you are interested in purchasing a carry bag the first specification you are likely to look at is weight. The eXo carry bag weighs in at 5.1 pounds. This puts it on the slightly higher side than many of the other bags out there. That said, I think there are more features built into the eXo carry bag that increases the weight. For starters there are the two extra handles at the top of the bag. When I wonder around my golf shop I mainly see bags with only a single handle at the top. I think the eXo carry bag is one of the only to have three handles. Those handles might make a difference when you are wresting with the bag in the trunk of a car or trying to get it thrown onto a cart quickly. The second is the sturdy stand that Wilson has chosen when designing the eXo carry bag. 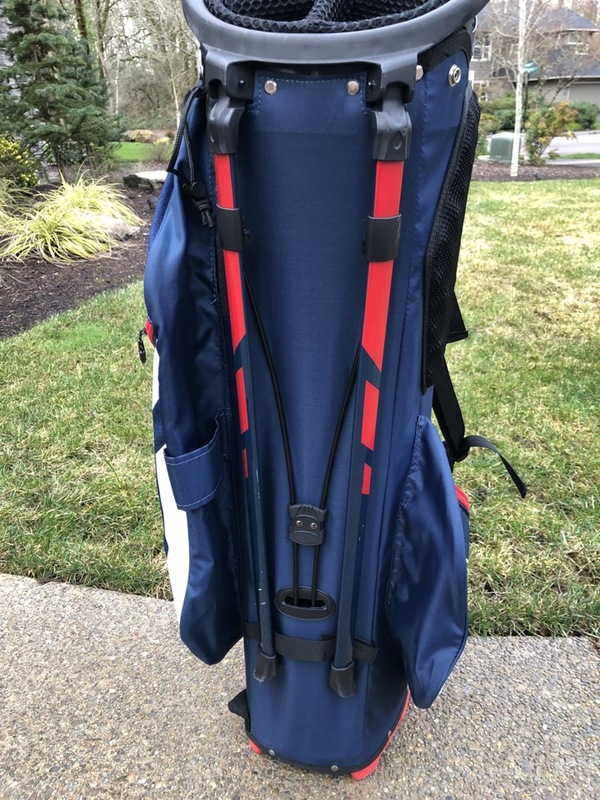 In this golfers opinion the extra half pound or so this bag weighs is more than offset by the features like the handles and stand built into the bag. My recommendation is to look beyond just the number and into the features the bag has. There are a few other features of the bag that deserve mention as well. I feel that for many bags the handle that is just beneath the main straps is often overlooked. Not with the eXo carry bag. It is very sturdy and well integrated into the bag. When I am wrestling with the bag to get it out of my tiny trunk the handle was easy to get at and you could feel comfortable giving it a firm tug. The other feature I found myself liking was the padding integrated into the bag. The padding in the straps was lush and very comfortable. It made carrying the bag easier. There was also a unique padding strategy where the bag sat on your back. They integrated and egg crate based padding which both massaged and padded your back as you carried the bag. The egg crate material also allowed air to flow in easily meaning I didn’t sweat too much carrying the bag. It also made it quite comfortable when it bounced into my back when sliding it onto myself just after picking it up. 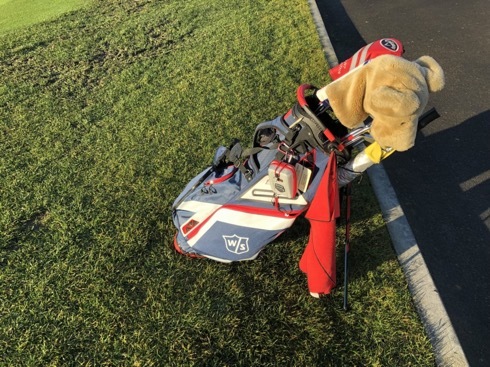 With the introduction of the eXo carry bag, Wilson has made a strong contender to consider when you are thinking about a new golf bag. 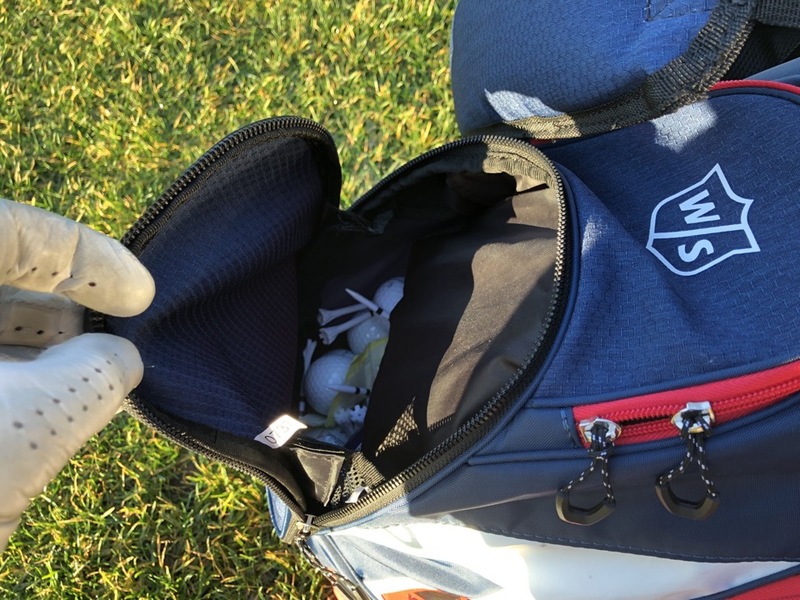 The extra handles, the large ball pocket, and special rangefinder pocket help to make it stand out against a crowded field of golf bags. I fell in love with the side handles and extra pocket for my rangefinder while finding the rest of the bag useful. Also the added benefit of easily finding the clubs made the bag an immediate favorite.